In the years following its publication, F. A. Hayek’s pioneering work on business cycles was regarded as an important challenge to what later became known as Keynesian macroeconomics. Today, as debates rage on over the monetary origins of the current economic and financial crisis, economists are once again paying heed to Hayek’s thoughts on the repercussions of excessive central bank interventions. 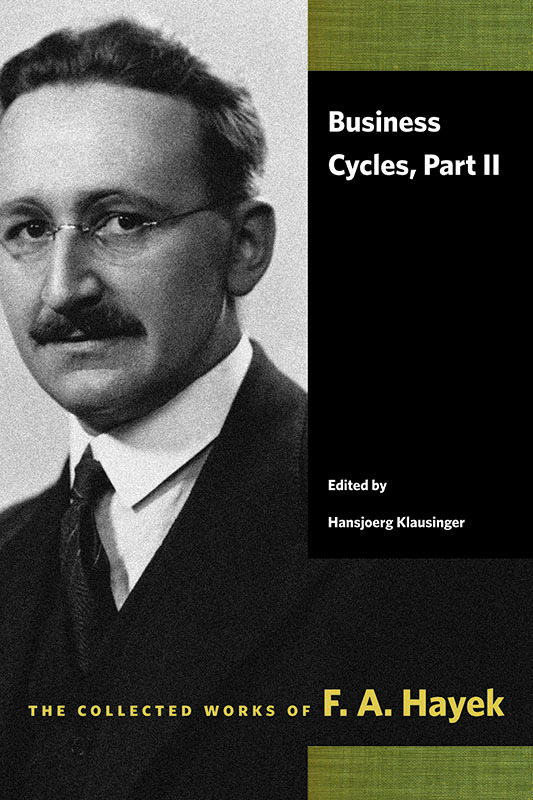 Business Cycles, Part I and Business Cycles, Part II bring together Hayek’s work on what causes periods of boom and bust in the economy. Moving away from the classical emphasis on equilibrium, Hayek demonstrates that business cycles are generated by the adaptation of the structure of production to changes in relative demand. Thus, when central banks artificially lower interest rates, the result is a misallocation of capital and the creation of asset bubbles and additional instability. Part I contains his two major monographs on the topic: Monetary Theory and the Trade Cycle and Prices and Production. Part II assembles twelve of his shorter papers on the topic, covering a period from the 1920s to 1981 and revealing the evolution of Hayek’s thought. In addition to bringing together Hayek’s work on business cycles, these two volumes also include extensive introductions by Hansjoerg Klausinger, placing the writings in intellectual context, including their reception and the theoretical debates to which they contributed. Hansjoerg Klausinger is Associate Professor in the Department of Economics at WU, Vienna University of Economics and Business. Editorial foreword and introduction by Hansjoerg Klausinger, index.